Tis the season where, to many, Christmas Day is viewed as World Juniors’ Eve. The annual under-20 world championship, taking place in Buffalo, N.Y., from Boxing Day through Jan. 5, is always a highlight on the hockey calendar. The 2018 edition has the potential to be one of the best in recent memory, with plenty of parity between the five powerhouse nations competing for three coveted medals in the 10-team tournament. 12 pm ?? v ?? 2 pm ?? v ?? 4 pm ?? v ?? 8 pm ?? v ?? Make that today. It all starts today. Twisted into context, I figured the world juniors would lose their lustre as a I got older but, now 33, this tournament is every bit as appealing and intriguing to me today as it was around the turn of the century when I was a teenager watching my peers go for gold. Granted, I try to stay young at heart, with an ability to relate to that age group since I cover junior hockey for a living, but the World Juniors are not getting any older. Instead, they are just getting better with time, and I’m looking forward to hopefully attending and covering the 2019 tournament in Vancouver and Victoria. For the teenagers of today, I do recommend checking out Dazed and Confused for a few good laughs and a couple lines that have stood the test of time. This is new, for the first time in the history of the World Juniors, there will be an outdoor game. The host United States will take on archrival Canada at New Era Field on Friday, with puck-drop projected for 3 p.m. ET (noon PT). The stage is set at @newerafield ? I’ve got mixed emotions. Obviously it’ll be a cool atmosphere, but I’m lukewarm on outdoor games in general because the quality of hockey typically takes a hit — be it due to weather and ice conditions or just an unfamiliar environment for the players to perform. Canada and the United States have staged a number of New Year’s Eve epics over the years, and this will be a rematch of the 2017 gold-medal game that saw the Americans edge Canada in a shootout for a 5-4 victory in Montreal. With so much at stake — this game could decide first place in Group A — I’d prefer they keep it indoors, and something tells me Dominique Ducharme and Bob Motzko would agree . . . at least the losing coach will after the fact. The players will be going a million miles an hour, so I just hope nobody gets hurt, and maybe they can meet again in the medal round under a roof. That game would be better, in my opinion. Stick tap to the Pegulas, Terry and Kim, for revitalizing hockey in Buffalo. From afar, they have done a marvellous job in putting the sport back on the map there. Or putting Buffalo back on the map for the sport. However you see it. Sure, their Sabres aren’t ascending the NHL standings this season and won’t likely make the playoffs, but the Pegulas are doing everything in their power to ice a winning product. They are committed to hockey in that city, hosting the annual NHL draft combine, attracting the world juniors, and even recently buying the Buffalo Beauts of the National Women’s Hockey League. Their facilities, KeyBank Center and the newer HarborCenter, in addition to New Era Field, will be on full display over these 11 days, and the owners should be proud spectators. Detroit is known as HockeyTown USA, but Buffalo is challenging for that title lately. The Pegulas and Buffalo hockey fans will be able to cheer on a few future Sabres in this tournament. Casey Mittelstadt, their 2017 first-rounder (eighth overall), will be a crowd favourite as a top-six centre for Team USA. Alex Nylander is primed to shine again for Team Sweden. Alex Nylander, their 2016 first-rounder (also eighth overall), has been loaned to Sweden by Buffalo’s AHL affiliate, the Rochester Americans, and should be dominant after tying for the top scorer (12 points, five goals) in the 2017 tournament. Nylander has led Sweden in scoring in each of the past two World Juniors. Ukko-Pekka Luukkonen, one of the Sabres’ second-rounders in 2017 (54th overall), is projected to be Finland’s starting goaltender and could backstop his country into medal contention. Finland floundered to a ninth-place finish at the 2017 tournament, replacing its coach partway through and barely avoiding the embarrassment of relegation. Expect the Finns to be back with a vengeance in 2018, boasting a much more experienced roster from top to bottom with tons of high-end talent. Eeli Tolvanen promises to be an electrifying player to watch for Team Finland. He is already tearing up the KHL as an 18-year-old, with 17 goals and 32 points in 39 games for Jokerit. Even without Patrik Laine and Jesse Puljujarvi, who are still age-eligible for the 2018 tournament despite being sophomores in the NHL. That dynamic duo, along with Carolina’s Sebastian Aho, powered Finland to gold in 2016. There’s been a strange trend for Finland over the last five years at the World Juniors — bad one year, golden the next. The country placed seventh in 2013, won the championship in 2014, placed seventh in 2015, won gold again in 2016, then fell all the way to ninth in 2017. So, I guess, this is Finland’s year and they have the roster to get it done. Always dangerous, especially offensively, the Russians have medalled seven straight times under Valeri Bragin, with three silvers and three bronzes (including 2017) since last winning gold in 2011. Russia will have lots of firepower up front again, with most of its top players already playing in North America. The forwards will be able to score with the best of them — even without Alexei Lipanov, a surprising cut — but can the defence and goaltending hold up? It’s the same old question and only time will tell. Vladislav Sukhachyov may or may not be the starting goaltender for Team Russia, and that may change throughout the tournament. Valeri Bragin likes to keep everybody guessing from one game to the next at the world juniors. Russia’s roster has medal potential again — especially if it tops Group B in the round robin — but the competition is going to be fierce, starting in the quarter-finals. Therefore, Russia isn’t a lock to keep its medal streak alive — not with a true top five in 2018, and even a sixth country possessing podium upside. That would be the Czech Republic, which is surprisingly stacked on offence but will need a standout goaltending performance to knock off any of the big five in the quarters. The Czechs have a big three up front — Martin Necas and Filip Chytil were both first-rounders in 2017 (12th and 21st, respectively) and both have already made their NHL debuts, while Filip Zadina could cement his status as a top-five pick for 2018 with a strong showing in this tournament. Ostap Safin fell to the fourth round in this year’s NHL draft, but he’s been trending well since crossing the pond to play major junior for the QMJHL’s Saint John Sea Dogs, producing 13 goals and 32 points in 33 games. Ostap Safin (QMJHL, Saint John) and Kristian Reichel (WHL, Red Deer) should be able to provide some secondary scoring, but depth is going to be a concern for the top-heavy Czechs. Their defence is decent, led by Libor Hajek and Ondrej Vala, but if the Czechs are going to play spoiler, Jakub Skarek will have to live up to the hype as the top-ranked goaltender for the 2018 draft. The Czechs aren’t flying under the radar for this tournament, not with Necas and Chytil on the roster. They are fully expected to finish top-three in Group B. In years past, Switzerland has been a Cinderella-type team capable of a stunning upset, but it will be missing Nico Hischier and won’t make as much noise in 2018. Rounding out the field are Slovakia, Denmark and Belarus, but they will be also-rans come the quarter-finals. I’m assuming Switzerland and Slovakia will finish fourth in their respective groups, but they won’t stand any chance against the top seeds. If there is one thing working against Canada, it might be the schedule. There will be no easing in this year, with the Boxing Day opener against Finland. Canada was impressive in routing the Czechs 9-0 and the Swiss 8-1 in pre-tournament tune-ups — though the Czechs didn’t dress any of their big-three forwards — but Finland promises to be a step up in competition. That game will set the tone for the tournament, ahead of the Canada-USA outdoor spectacle that should be easy to get up for, but perhaps hard to execute in. Losing to both Finland and the United States would make for an extremely tough road for Canada in the medal round. By my count, there are six North American pros on loan for this year’s tournament, along with a number of European pros. 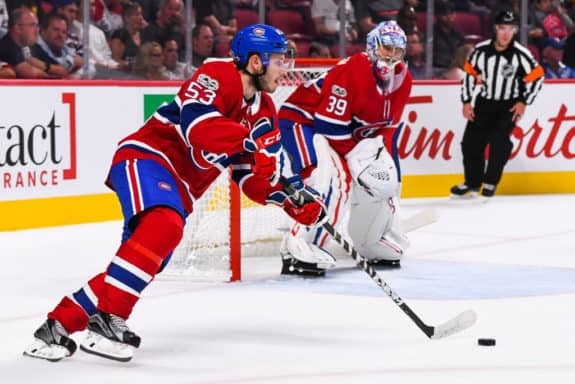 Victor Mete made the surprising jump to the NHL’s Montreal Canadiens this season, pairing with Shea Weber out of training camp and tallying four assists through 27 games. Canada has the lone NHLer in Montreal Canadiens defenceman Victor Mete. Sweden is the only team with two North Americans pros in the aforementioned Nylander (AHL, Rochester Americans) and blueliner Timothy Liljegren (AHL, Toronto Marlies). Finland, Russia and the Czech Republic each have one AHLer, with Janne Kuokkanen (Charlotte Checkers), Klim Kostin (San Antonio Rampage) and Filip Chytil (Hartford Wolf Pack), respectively. They should all be impact players — the men amongst boys this year — and be in the mix for tournament awards. At the other end of the age spectrum are a half-dozen highly-touted draft eligibles. Typically a tournament for 19 year olds, some of these under-agers have the potential to steal the show. Scouts will be salivating from start to finish since there could be six of the top-10 selections in the 2018 NHL draft on display. Rasmus Dahlin will try to rise to the occasion on the world-junior stage. 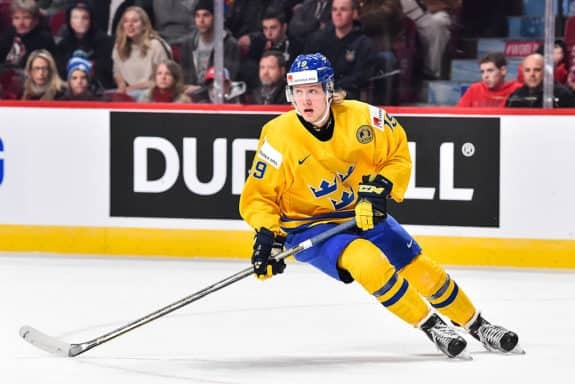 Sweden’s roster features dynamic defenceman Rasmus Dahlin, the frontrunner to be picked first overall. Russia went younger than usual to include Andrei Svechnikov, who could be the second-coming of Ilya Kovalchuk and also enters this tournament as a top-two prospect for 2018. The Americans have two draft-eligibles in power forward Brady Tkachuk — Keith’s younger son, who plays with a similar edge to Matthew (Calgary Flames) — and puck-moving defender Quinn Hughes. The Czechs have Zadina — often considered a top-five talent for 2018 — and Finland rostered Rasmus Kupari as a creative forward. Sweden is also bringing Isac Lundestrom, who could push for the top 10 and be a real draft riser with a strong tournament — similar to Lias Andersson last year. Andersson is captaining the Swedes this year, but they won’t have Adam Boqvist on the back end as another top-five candidate for 2018. That’s unfortunate — the Boqvist brothers would have been fun to watch, with the elder Jesper (New Jersey Devils) making the cut as a forward — but draft enthusiasts can’t wait for the puck to drop on this showcase. There’s obviously some big-name talent at this year’s tournament, but every year there are under-the-radar prospects who use the world juniors as their coming-out party. Canada has Max Comtois, once a projected top-10 pick for 2017, and Drake Batherson, who was passed over entirely in the 2016 NHL draft. Both are depth forwards who could take on bigger roles as the tournament progresses. 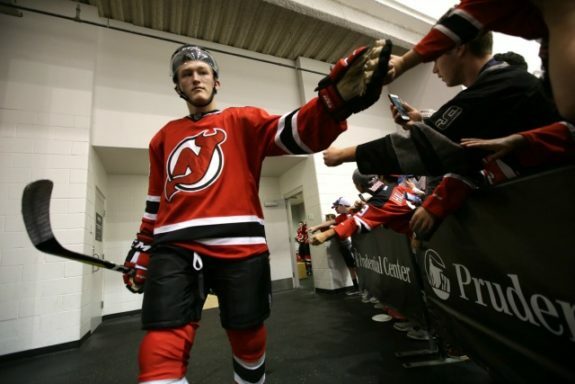 Joey Anderson has a future with the New Jersey Devils, but he’ll be doing his best to leave his mark with Team USA in the present. The Americans are captained by Joey Anderson, who still isn’t regarded as a blue-chipper, while Patrick Harper could be this year’s Troy Terry. 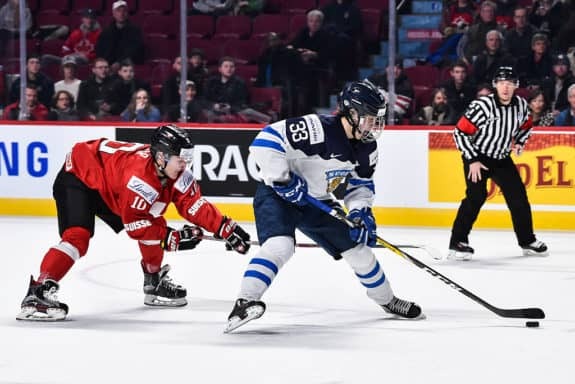 Finland’s Kristian Vesalainen was a later first-round pick by Winnipeg this June and while he’s no Patrik Laine, Vesalainen is thriving in the men’s league back home in his draft-plus-one season and could be a driving force amongst his peers. Joni Ikonen, a second-rounder for Montreal, may also exceed expectations offensively. Sweden’s forward depth includes Oskar Steen, a standout at the Summer Showcase, and Marcus Davidsson, another Sabres prospect who will be overshadowed by Nylander’s presence but capable of making a name for himself. Russia’s goaltending should be fascinating — be it Mikhail Berdin or Vladislav Sukhachyov between the pipes — and Artur Kayumov reminds me of Artemi Panarin. He’s got that kind of upside and, not surprisingly, he’s drafted by Chicago. Defence wins championships, right? It will definitely be the dominant position at this year’s world juniors. Not to take anything away from the forwards or even the goaltenders, but the real star power is on the back end. The debate over which nation boasts the best blue line will rage on, but there are a few contenders for that title. Miro Heiskanen, the third overall pick in this year’s NHL draft by the Dallas Stars, could be the top blueliner for Team Finland. 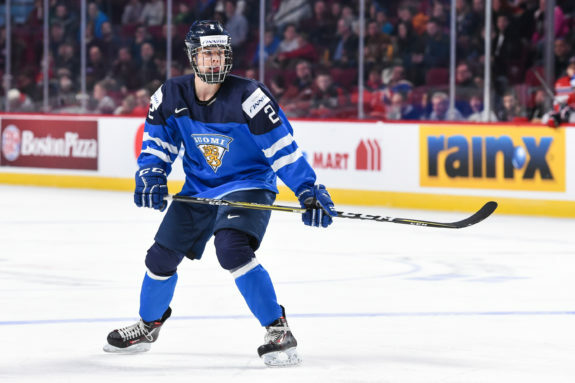 Finland has five first-round picks — Olli Juolevi, Miro Heiskanen, Juuso Valimaki, Henri Jokiharju and Urho Vaakanainen — plus a second-rounder trending up in Robin Salo. That will be tough to beat. Sweden has three of the top offensive threats among all defenders in Liljegren, Dahlin and Erik Brannstrom, who may be the closest comparable to Erik Karlsson. Adam Boqvist is cut from that cloth too but didn’t make the world-junior cut. Gustav Lindstrom and Jacob Moverare could have been mentioned as sleeper prospects as well. Canada is eight deep on defence, counting Josh Mahura, who was recalled as a possible injury replacement for Dante Fabbro. They are all worth naming, with Mete, Kale Clague, Jake Bean, Cale Makar, Conor Timmins and Cal Foote rounding out a stacked group that rivals Finland. That’s not to mention Adam Fox and Hughes for the Americans, Hájek for the Czechs or Russia captain Yegor Zaitsev. The list goes on. So many upper-echelon defenders that we’ll be watching in the NHL soon enough. Predicting this award is practically impossible. Of the 20-some names that I just rattled off, my top 10 would be Fox, Clague, Liljegren, Mete, Juolevi, Heiskanen, Brannstrom, Bean, Dahlin and Makar. That’s not narrowing it down a whole lot, but that’s the top tier of contenders in my opinion. Any of them could step up and win this award. My vote, from the outset, is going to Fox. I think he’ll lead all defencemen in scoring and play a key role in the Americans’ offence, especially on the power play. USA WJC coach Motzko on CGY's Adam Fox, "He's taken his game to a whole other level." Nylander and Mittelstadt have to be the betting favourites. Yes, a battle of Buffalo prospects. Elias Pettersson, as Nylander’s set-up man, deserves serious consideration since he’s already lighting up the Swedish men’s league. Finland has a few possibilities in Kuokkanen, Eeli Tolvanen or Aleksi Heponiemi. Canada’s top line seems to be clicking, so it could be any of captain Dillon Dube, reigning WHL player of the year Sam Steel or OHL scoring leader Jordan Kyrou. If not Mittelstadt from the U.S., Logan Brown and Kailer Yamamoto are legitimate candidates as well. We can’t forget about the Russians, with Svechnikov, Vitaly Abramov, Kostin and Dmitry Sokolov among those capable of taking the torch from Kirill Kaprizov, who tied Nylander for last year’s tournament lead with 12 points but earned the award on the strength of nine goals. Necas and Chytil warrant mention here too, but the Czechs probably won’t score enough in general. Smart money is on Nylander again, but I’m going with Mittelstadt. I really like his chances. Another award sure to be hotly contested, with as many as eight contenders in the crease. Canada’s Carter Hart might be the favourite, but Sweden’s Filip Gustavsson and whoever the Americans declare their starter come the medal round — be it Joseph Woll or Jake Oettinger — will be in the mix. Finland’s Luukkonen seems like more of a long-shot, along with Russia’s Berdin or Sukhachyov, and even Skarek from the Czech Republic. Carter Hart’s stats in the Western Hockey League are off the charts this season — .961 save percentage and 1.32 goals-against average — and he’s been in a zone similar to Carey Price when he’s at his best. 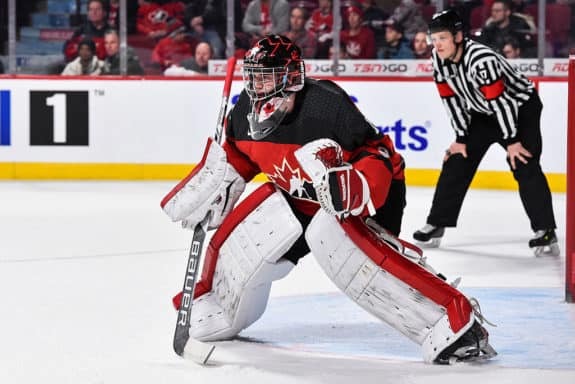 Hart will be hoping that success translates to the world juniors for Team Canada. Naturally, this award often goes to the goaltender of the winning team. No spoiler here, but I’m leaning towards Hart, who could be an exception to that trend. I do believe Hart is the best netminder in this tournament, win or lose. The MVP is a forward more often than not, with the top scorer sometimes sweeping both. However, last year’s most valuable player was a defenceman in Canada’s Thomas Chabot, so anything is possible. Mittelstadt, Fox and Hart — my positional award winners — could emerge as MVP candidates, but I’ll take the favourite here too. That being Nylander. He hasn’t had much success in the AHL to date and missed a couple months with a lower-body injury to start this season, but if Nylander can get up to speed for the world juniors, he should be the best player on the ice — AKA the MVP. Whenever the tournament is hosted in North America, Canada is almost a lock for a medal. Going all the way back to 1974 — to the beginning of the world juniors — Canada has medalled in 17 of the 18 tournaments held on the home continent, winning eight gold, seven silver and two bronze. That includes 13 in a row dating to 1991 — seven gold, five silver and one bronze — with the lone exception being 1989 in Anchorage and Eagle River, Alaska, when Canada finished fourth behind the Soviet Union, Sweden and Czechoslovakia. So, based on history, that’s a 94 per cent success rate and, therefore, Canada’s medal chances in Buffalo would appear extremely high. Yet, I’m not convinced this year’s group can make it 14 straight in North America. Canada’s roster isn’t bad by any means, but the competition is as stiff as ever and the schedule is working against Canada. Offence could be hard to come by, the forwards will have to score by committee, and Hart will need to be at the top of his game from start to finish. The defence should be a strength, at least once the puck is in their possession. To that end, Canada’s offence will start from the defence and a quick transition game. Still, I’m not sure it’ll be enough to medal this time around in Buffalo, where Canada settled for silver in 2011 after blowing a 3-0 lead in losing the championship game to Russia. In fact, I think Canada could go through a two-year medal drought at the world juniors since I don’t anticipate a strong roster for 2019 in Vancouver-Victoria. Being Canadian, that pains me to say and it feels like an act of treason, but I’m just being honest and calling it like I see it. For the record, I foresee Canada getting back on top — yes, winning gold — in 2020. That’s my long-term prediction. Then, in the quarter-finals, I’m taking the U.S. over Switzerland and Finland over Russia in one bracket, with Sweden over Slovakia and Canada over the Czech Republic in the other bracket. If that comes to fruition, the semifinals would pit Sweden against Canada and the U.S. against Finland. After much deliberation, my winners were Sweden and the U.S., to face-off for gold, while Canada and Finland were left to battle for bronze. That would be an intriguing championship game since Sweden has a history of choking in the medal round after running the table in the prelims, while the U.S. has never won gold on home soil or repeated as the world-junior champion. In the end, I went with Sweden over the U.S., with Nylander playing the role of hero in a shootout, while Finland avenges a loss to Canada in their Boxing Day opener. That’s gold for Sweden, silver for the United States and bronze for Finland. What are your predictions for the 2018 World Junior Hockey Championship?